On this page, you'll find various information maps about France, showing the country, regions departments and other useful themes to help you discover more about the land and people. The maps listed below are ideal for school homework and projects, they are very simple and can easily be printed or used in your projects. If you use these maps please respect our work. Mountains of France showing the principle mountain ranges, such as the Alps and Jura. How to draw a map of France ? 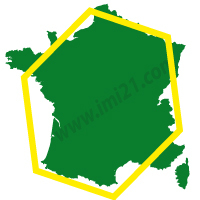 If you have to draw a map of France without any references, simply draw a hexagon shape. This will give you the basic outline of the country and a good starting point. The French often refer to mainland France as "l'hexagone", as the shape is similar to a hexagone.